Roberta Warshaw Art and Design: Featured on Honey Bijou! I was both excited and happy to be featured yesterday on Jenna’s Honey Bijou Hive Five blog along with 4 other jewelry artists including Heather Powers, Kristi Bowman, Lorelei Eurto, and Lynda Moseley. What company! Any jewelry artist would be proud to be among these wonderfully creative artists. 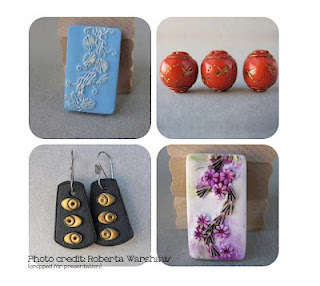 Jenna chooses 5 polymer clay artists and/or jewelry designers every month who inspire her and features them on her blog called Honey Bijou. Jenna and her partner Kim, both from Napa California, have a wonderful Etsy shop as well which you simply must check out. They have these tribal mask pendants which I have been drooling over since I first laid eyes on them. I have never been able to sculpt faces too well so these are inspiring to me! Thanks again Jenna for featuring me! Congratulationns! A wonderful set of designers to receive a shout out, for sure! Saw you on Lori's blog for the flower challenge. Nice work! Make sure you put your art on her Daily blog page, so we can link to and check your blog out and leave comment. I did the same thing.Going to fix now! Hey it's fun to learn about a new blog (Honey Bijou) and to see you in such great company. I'm sure the others like being in your company as well! Congratulations on all of your well deserved recognition. I love seeing how much fun you are having with polymer. You're very welcome, and thanks for the shout back! You know what's funny about those tribal masks is that I thought I couldn't sculpt faces either until I made those. Breaking it down into basic shaped took all the intimidation out of it.